Moana Sands Conservation Park is a protected area located in the suburb of Moana in South Australia about 35 kilometres (22 miles) south of Adelaide. It was proclaimed under the National Parks and Wildlife Act 1972 in 1985 for the purpose of conserving a ‘significant Aboriginal cultural heritage site' associated with the Kaurna people.’ A statement of significance published after the park's dedication in 1985 advises: ‘prehistoric significance (aboriginal flakes, implements, evidence of burials)’ and ‘unusual red sands.’ The conservation park is classified as an IUCN Category III protected area. ^ a b "Protected Areas Information System - reserve list (as of 17 Feb 2014)" (PDF). Department of Environment Water and Natural Resources. Retrieved 26 March 2014. ^ "CAPAD 2012 South Australia Summary (see 'DETAIL' tab)". CAPAD 2012. Australian Government - Department of the Environment. 6 February 2014. Retrieved 6 February 2014. ^ "Moana Sands Conservation Park". 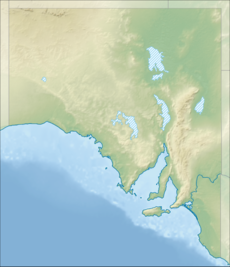 Gazetteer of Australia online. Geoscience Australia, Australian Government. ^ "Moana Sands Conservation Park". Department of Environment, Water and Natural Resources. 2014. Retrieved 25 October 2014. ^ "Register of the National Estate (Non-statutory archive), Moana Sands Conservation Park, Esplanade, Moana, SA, Australia". Commonwealth of Australia, Department of the Environment. 1985. Retrieved 25 October 2014. This page was last edited on 3 January 2019, at 07:24 (UTC).